With the beginning of Spring just around the corner, I am ready for some lighter, fresher, dishes and nothing says Spring eating like a good pasta primavera. This is, of course, made better by heavy cream and cheese, right? What if I were to tell you that you could have that creamy, cheesy, goodness and it would be low calorie and healthy? Don't believe me? 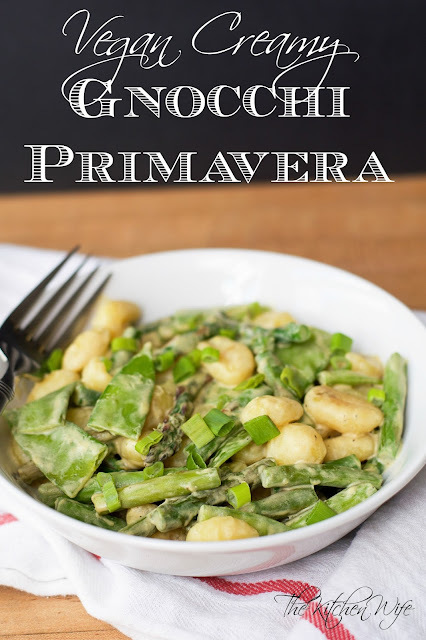 Well let me introduce you to my Vegan Creamy Gnocchi Primavera Recipe! To begin you will need to place a pot of salted water over high heat and bring to a boil. 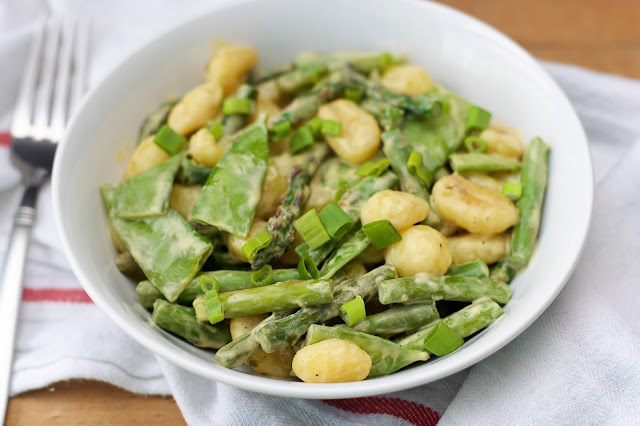 This is a quick cooking meal so while you are waiting for the water to boil take this time to trim and cut your asparagus, halve the snow peas, slice the green onions, as well as the garlic. When the water has come to a boil add your gnocchi. Next place a deep skillet over HIGH heat and add the coconut oil. Allow the pan to become SMOKING HOT. Once the pan is hot you can add all of the vegetables. Season with salt and pepper, and sauté 3-4 minutes until tender. When your vegetables are tender, remove them from the pan and place to the side in a bowl. Let the gnocchi cook just long enough for the water to come back to a boil. Add it to the hot pan on the stove. Let the gnocchi brown for 3-4 minutes until you see these kinds of crispy golden bits. Now return the vegetables to the pan. Add the nutritional yeast and toss everything together until it is well coated. Nutritional yeast it what is going to give it that mind-glowingly cheesy flavor. It can be difficult to find in some areas, so I will leave an affiliate link (HERE). Now you can add the coconut creamer. This is just the plain coconut creamer that you can get at pretty much any grocer. It is usually located with the coffee creamers. Stir everything together and let it simmer for 3-4 minutes until the sauce becomes nice and thick. Taste for seasoning, I needed to add a little salt and pepper to it, and you are ready to eat! Look at how absolutely stunning this dish is! And can you believe how creamy and cheesy this looks!?! Remember there is no dairy in this dish whatsoever. And the flavor...you get all of that crisp freshness from the veggies with the soft chewiness of the gnocchi with that sauce. Oh man, that sauce, its so blooming cheesy that is mind blowing! *BOOM* Who knew that comfort food could actually be healthy WHA!?! So if you are trying to eat more plant based meals in your diet, or maybe you are trying to live a plant based lifestyle, you are definitely going to want to give this Vegan Creamy Gnocchi Primavera a try TONIGHT! While you are wait for the water to come to a boil, prepare your vegetables. Once the water has come to a boil add the gnocchi. When the pan is SMOKING HOT add the vegetables and cook for 3-4 minutes. Remove the vegetables from the pan and sit to the side. As soon as the gnocchi comes back up to a boil, turn off the heat and drain. Place the gnocchi in the hot skillet and let brown for 3-4 minutes. Return the vegetables to the pan and add the nutritional yeast. Toss everything together until is it well coated with the nutritional yeast. Add the coconut cream to the pan and bring to a simmer. Let cook for 3-4 minutes until the sauce thickens.